Rescues, Rogues and Rough Seas is a story of great adventure as told by the men and women of the Western Australia Water Police. Stories of bravery, dedication, humour and overwhelming sadness are told through historical archives and by the police officers themselves. West Australians live and work by the sea and are home to the largest police jurisdiction in the world. The story takes the reader on a journey through 150 years of Water Police history, capturing the romance of heroic sea rescues, dangerous criminals, ocean chases and recovery operations. From its colonial beginnings in 1851, through the pioneering days of old Fremantle and its harbour and into the gold rush and war years. 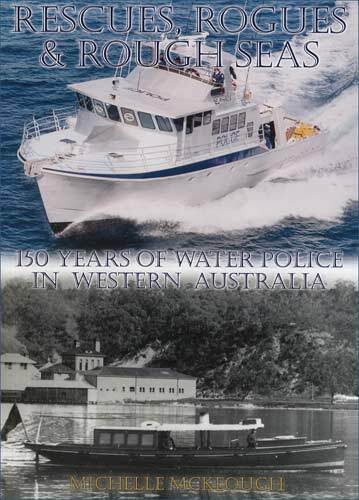 To more recent exploits of the diving squad, Police Vessel Delphinus and the marine investigations area, the Western Australia Water Police has both a long and proud past and an important future for Western Australia. Available through the WA Police Historical Society's Hon. Treasurer, Ms Val Doherty APM. Cost $25.00 (plus P.& P.) ..... Cheques and money orders should be made payable to the "WA Police Historical Society".